During my first week as a newly donned ESL Instructor, I participated in an orientation workshop, a requirement for new recruits from one of the schools at which I worked. The meeting was basically an express version of the month long TEFL course many of us had recently completed: the school covered its bases by sufficiently ” training”? us in one afternoon; we teachers handled the boredom of repetition by following the three hour meeting with the reward of happy hour. Towards the workshop's end, the senior teacher leading us pulled out an old, spiral bound binder. It was a photocopied mess, clearly well-used, but absurdly out of place next to the gloss and color of Cutting Edge Intermediate and International Express. This unassuming binder, we were told, would become our lesson planning bible. We would fight over it, laugh over it, give thanks to it. We would consistently fail to find it on the library shelves, because one of the 200 teachers on staff would undoubtedly be leafing through its worn pages. Initially, I brushed off those lofty words. But within two weeks of attempting to juggle my new schedule of twenty unique lessons a week, I became a believer. The book's title was Taboos and Issues, and inside, it held thirty-two fully planned lessons that spanned from abortion and homosexuality to which nationality made the most irritating tourists. That book saved my ESL life on many an occasion. Visitor in town and no time to lesson plan? Shy student who needed to practice conversation? Dread at the thought of spending another hour on the proper use of the present perfect? There was undoubtedly a taboo or an issue to photocopy and pass around. Lesson planning is a downside of the teaching profession in general: you have to take your work home, but you are only paid for your hours inside the classroom (or your student's office, as is often the ESL case). 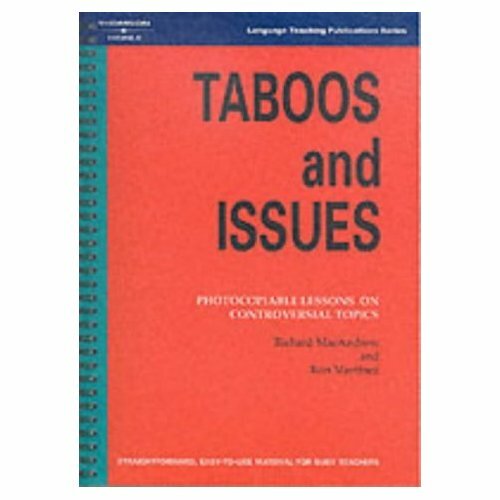 Taboos and Issues made our lives easier. It did the planning for us. It let us use our brains when we couldn't fathom correcting more spelling mistakes. And, it prepared our students for the real world. The high school courses my students had already completed didn't cover the vocabulary for the pro-choice or -life debate. But the next time they entered a bar outside the Czech borders, I'm confident they were able to sustain a conversation well beyond, ” What's your favorite hobby?”? I'd qualify that as a job well done. Thanks for commenting on Leslie's article. I can certainly see how the controversial subjects would help awaken the quiet students and get them engaged.